Jewish Humor Central: Remembering Abe Vigoda as Chief of the Waponis in "Joe and the Volcano"
Remembering Abe Vigoda as Chief of the Waponis in "Joe and the Volcano"
Abe Vigoda, the tall, dour-faced and slouch-shouldered character actor who died yesterday at the age of 94, proved himself in both gritty dramatic roles, and as an actor with wonderful comedic timing. As he was profiled on the IMDb film website,Vigoda was born in Brooklyn, New York, to Lena (Moses) and Samuel Vigoda, both Russian Jewish immigrants. His father was a tailor on the Lower East Side. He made his first stage appearance at the age of 17 and plodded away in small theater shows for over 20 years. For the majority of film-goers, Vigoda first came to prominence in The Godfather (1972) as the double-crossing Tessio, pleading with Robert Duvall to get him off the hook "for old times' sake." He also appeared in its sequel. Vigoda had roles in a few nondescript TV films before landing the plum part of Sgt. Phil Fish on the brilliant sitcom Barney Miller (1974). Perhaps his best known role, Sgt. Fish proved popular enough to be spun off to his own (short-lived) series Fish (1977). With his long face and unusual looks, Vigoda remained in high demand in mafioso-type roles, and for a while in the mid-1980s, he was mistakenly believed to have been dead, leading producers to remark, "I need an Abe Vigoda type actor," not realizing Vigoda was still alive and well. The 1990s and beyond became busy again for him, with appearances in North (1994), The Misery Brothers (1995), A Brooklyn State of Mind (1998), and Crime Spree (2003). He continued acting into his 90s, surprising audiences with his entertaining style. One of his funny roles was in Joe Versus the Volcano, a 1990 American romantic comedy film starring Tom Hanks and Meg Ryan. Vigoda had a supporting role as Chief of the Waponis. In the film, Joe (Tom Hanks) is diagnosed with an incurable disease, quits his dehumanizing job, and accepts an offer to briefly "live like a king, die like a man" - but to fulfill his agreement he must willingly jump into a live volcano on the island of Waponi Woo in order to appease the volcano god. En route to the island, Joe meets a series of interesting characters in NYC and LA, then boards a yacht, captained by Patricia Graynamore (Meg Ryan). During the voyage Joe and Patricia survive disaster, fall in love, and finally arrive at the island where they face their destiny. The film received positive reviews from some critics, including Roger Ebert, who described the film as "new and fresh and not shy of taking chances", and also was a box office success in the US.It has since become a cult film. The full movie is available on YouTube at https://youtu.be/RjsLqFohMjc. It's an hour and 42 minutes long. 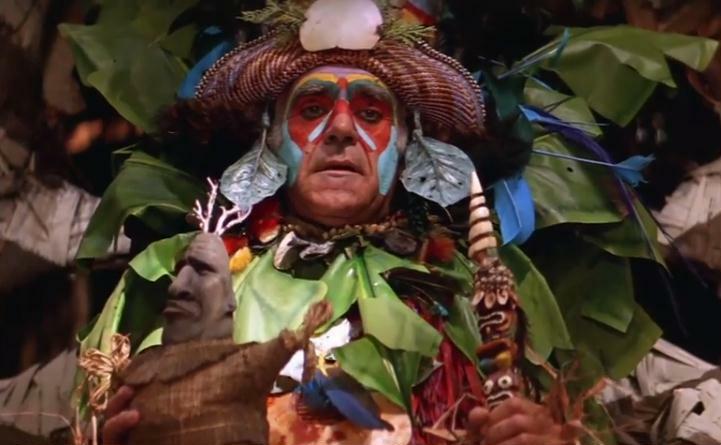 Here is a scene featuring Abe Vigoda as Chief of the Waponis.